We love having visitors! 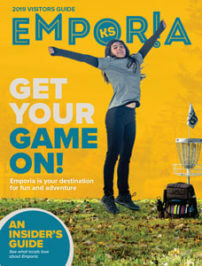 Our mission at the Convention and Visitors Bureau is to inspire people to visit, stay, dine, shop and play in Emporia. Whether you are an outdoor adventurist, day tripper, art lover, history buff, foodie or simply looking for someplace to have a family outing, we want you to come often and stay as long as you can. To get you started on your visit, here is part one of our list of “must do’s” when you’re in Emporia. There is plenty to love about Emporia’s local scene. With locally made brews and wines, chocolates and coffees, and unique artisan goods and souvenirs, living like a local has never been so good. Emporia’s first brewery since prohibition, Radius Brewing Co., has a rotating set of craft beers on tap, which you can see brewing right in the middle of the dining room. The kitchen serves up brick oven pizzas, unique sandwiches and a tantalizing rotating chef’s menu. Voted Best Brewery in Kansas by Yahoo Travel and named 2018 Existing Business of the Year by the Kansas Small Business Development Center, Radius is located at 610 Merchant Street. Nestled in the heart of downtown, stop by Twin Rivers Winery and Gourmet Shoppe for a flight of handcrafted wines produced on-site. With over a dozen wines and ciders made from varietals of grapes that are grown in Kansas, the tasting room is a must see during any visit to town. Twin Rivers is located at 627 Commercial Street. Emporia is a culinary hot spot and the restaurants here will satisfy any craving. From chic food trucks to exciting ethnic cuisine to delicious comfort food, you’ll have a memorable experience when you dine in one of Emporia’s unique eateries. Do-B’s is a local favorite that draws in diners from all over the region with burgers that start with 100% USDA grade choice ground steak patty, mouth-watering Philly cheese steaks and hearty Po-Boys. Recent accolades include Absolute Best Burger in Kansas by msn Lifestyle and Yelp, Best Sandwich Shop in Kansas by Travel + Leisure Magazine and one of the Top Twenty Local Eateries in Kansas by KANSAS Magazine’s Readers’ Choice. Do-B’s is located at 704 E 12th Ave.
Amanda’s serves up delicious sandwiches made with their fresh-baked-daily bread, sinfully delicious cinnamon rolls and desserts that are definitely worth the splurge. Voted one of Kansas Magazine Reader’s Choice Top Twenty Local Eateries in Kansas, Amanda’s is located in the historic Kress building at 702 Commercial Street. Handmade truffles and chocolates, fudge, in-season chocolate-dipped strawberries and caramel apples, and other confections at this specialty chocolate shop are sure to satisfy your sweet cravings. Sweet Granada uses premium ingredients to make gourmet candies daily. The store is located at 803 Commercial Street. Emporia is a short drive from everywhere! Come for a visit and see for yourself all the fun, quirky one-of-a-kind places to go and things to do in Emporia. For more ideas check out our Web site www.visitemporia.com.